Bring the family and join us for the 2019 Green Bay East Side Baseball Kickoff Event at Optimist North and South! Players can choose to compete in the Home Run Derby, Skills Competition or both! Each paid participant dressed in their 2018 jersey will get a free hotdog! In addition to watching the older players complete, we will have some free activities for the younger children to enjoy including ball toss, whiffle ball hitting and base running. It is with great excitement that we share with you that construction at East River Optimist Park is tentatively set to begin on June 3rd. We would like to say thank you to all who made this dream possible! A new parking lot for 47 cars and 2 spaces that are handicap accessible. A circle at the end of the parking lot to make turning easier. A new concession stand with bathrooms. Walkways to the East River Trail, concessions stands, parking lot, etc. Space for a playground to be built someday in the future. These changes will increase the safety and convenience for all who visit the East River Optimist Park, especially our baseball families. We will keep you posted on any impacts that the construction will have on parking and/or game schedules as they become available. Purchasing a new bat for this season? The Green Bay East Side Baseball League (Minors and Majors) implemented the new Cal Ripken Bat Rule as of the 2018 Season and it is continuing in 2019. All bats must have the USA stamp you see below on the handle to be used. There will be no exceptions to this rule. All players are covered by insurance provided by Cal Ripken and therefore we must follow their rules. BBCOR and bats that are stamped USSSA will not be allowed. 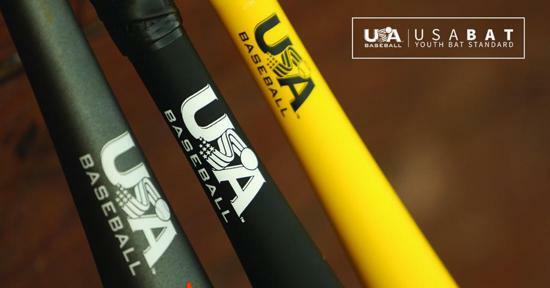 CLICK HERE FOR A LIST OF USA APPROVED BATS. Bats should be clearly marked with the new stamp, but be sure to ask a store/website associate if you're unsure. Did you lose something at the field? Lost items can be found in a bin at Optimist North and Optimist South concession stands.